Congratulations you have found your next teaching assignment abroad and it’s in the UAE. As many Canadian teachers have found careers in private and public schools in Abu Dhabi, Dubai, Sharjah, the Expat community has grown and so have the opportunities. Please ask us about the UAE city you will be teaching in and how we can help you be prepared. Before leaving for your new job, as part of the process to validate your qualifications, you will be asked to authenticate and legalize certain documents such as your Diploma, Degree, Teaching Certificate, Criminal Record Check or Marriage Certificate if your spouse is joining you. So what does this mean? To help you get your documents ready for your next teaching job we will explain what is required for the process. Before taking the first step of authentication you must have the correct documents and they must qualify with Global Affairs Canada here in Ottawa. If your diploma, degree or certificate have been issued by a Canadian University or College either the original or a notarized copy can be authenticated. This also applies to your marriage certificate which to qualify must be the one issued by Vital Statistics. If you prefer not to use your original documents, we understand ask us about how we can assist you with a notarized copy. If your police check is not issued by RCMP Headquarters in Ottawa it will need to be notarized but not to worry we can assist you with this. Normal processing time for authentication with Global Affairs Canada is 25 business days when dealing with them directly, but with our assistance we will shorten this to 1, 3 or 10 business days to meet your time line. Once we have authenticated the documents on your requested service time they will be ready for the second step of legalization at the Embassy here in Ottawa that is also called Attestation in the UAE. 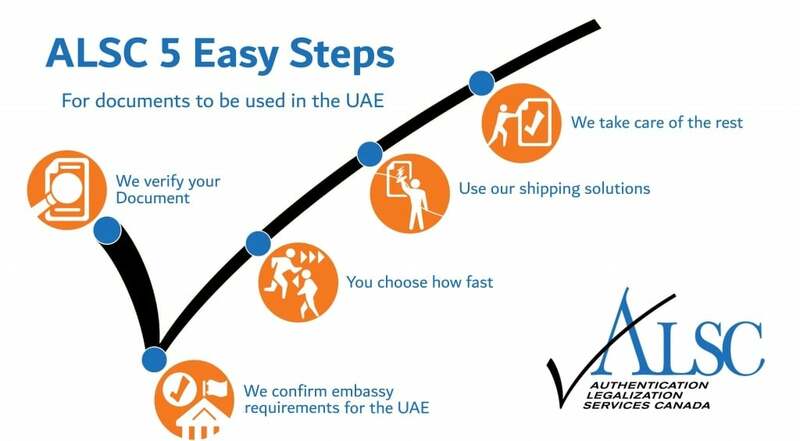 The UAE Embassy does have certain requirements that must be followed in order for your documents to be legalized. If any of the requirements are not followed it will cause delays or non-processing in some cases. To save you any of these inconveniences our 20+ years of assisting teachers locate abroad is at your service to provide you peace of mind throughout the authentication and legalization process. As the embassy does have various speeds of service our consultation with you will help you find what is best for you. Once the UAE Embassy has legalized your documents they are now ready for your next teaching assignment. Don’t leave your next teaching opportunity to chance make sure that your documents are prepared properly and backed by our service guarantee that they will be accepted by your new employer in the UAE. If you need to Apostille, Authenticate or Legalize your teaching certificates for the United Arab Emirates UAE we can help.